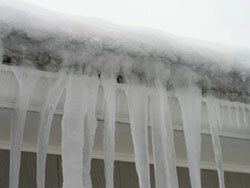 What is causing icicles to form on the gutters and roof of your house when it is freezing? Inadequate Attic Insulation Causes Ice Dams. Ice dams occur when snow melts on sloped roofs and then refreezes again. They are most often caused by attics and roofs with inadequate insulation. Two circumstances combine to make an ice dam. Backed up water can get under the shingles and through the roof deck. It can drip on the ceiling insulation or run down the underside of the deck to the connection between the roof and the walls. It then makes its way into the building in the form of damaging leaks. It can also lead to mold and mildew. Melt water under the unmelted snow can decrease the friction between the snow and the roof and cause a dangerous snow slide, like an avalanche. Melt water often refreezes as icicles hanging from the gutters or edge of the roof. These icicles eventually break off when they get too heavy. Both snow slides and falling icicles endanger passersby. TN Spray Foam Insulation & Roofing Services from Tennessee's Leading Foam Contracting Solution! Call us today to discuss the best insulation options for your home, including spray foam insulation cost, benefits, r-value and more at 855-GET-FOAM (438-3626). Our Tennessee spray foam contractors provide high-quality spray foam insulation services for residential and commercial applications and foam roofing services for industrial and commercial buildings. We offer competitive spray foam insulation pricing in TN and ultimately help you save money on utility bills. © 2016 SprayFoamLocal Network. Spray Foam Tennessee. All Rights Reserved.